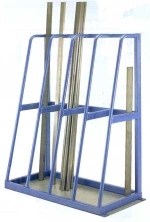 See our medium and heavy-duty range of sheet, plate, board, bar and tube racking, all have a fully welded construction and a durable polymer powder coated finish. We also offer an in house design service. So if you cannot see a product to meet your requirements please contact Liftsafe Directs sales and design staff, we are sure we can help. Fully welded steel construction with steel base, pre-drilled for bolting to floor. 250 mm distance between storage bays support bars. Durable powder coated finish. 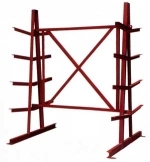 This multi-height plate rack is ideal for full size and other various sizes of sheet and board. 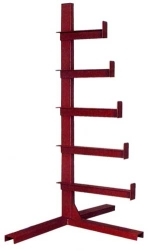 Support bar heights: 400, 550, 700, 850 and 1000 mm. Distance between bars: 160 mm. Fitted with a sheet steel base pre drilled for floor fixing. Durable powder coated finish. Fully welded construction "A" Frame design, double sided, and 4 x 400mm arms per side, fixed at 375mm centres. 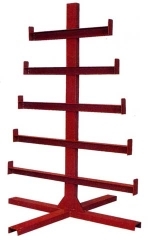 Strong, fully welded double sided arm bar rack, with fixed stop on all arms. Used in multiples to support long loads. 250mm arm spacing, 250Kg load capacity per arm. Top arm 350 x Bottom arm: 600 mm. Durable powder coated finish. 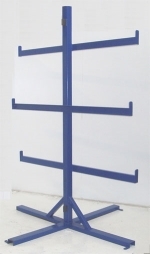 Strong, fully welded single sided arm bar rack, with fixed stop on all arms. Used in multiples to support long loads. 250mm arm spacing, 250 Kg load capacity per arm. Top arm:350mm Bottom arm:600 mm.